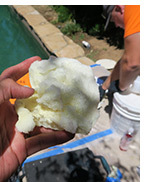 Once we have pinpointed the location of a broken pool pipe, the line then needs to be repaired. 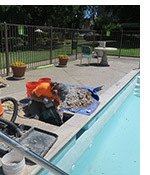 Because your pool deck is the only thing people see once the repair is complete, we understand the importance of minimizing excavation. To make a clean hole, we start by saw-cutting the concrete. The concrete deck and the gunite underneath are then jackhammered out to expose the pipe. 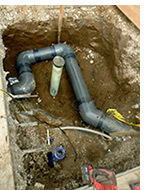 Our trained technicians carefully cut out the broken section and use signature repair techniques to reconnect the pipe and minimize restrictive flow.